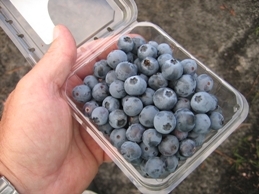 A pint of fresh blueberries packaged in a clamshell. Blueberries are a popular, high-value small fruit crop that can be profitable in both large- and small-scale production systems. 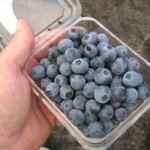 With proper site selection and preparation, and with the right cultivars, blueberries can be grown statewide, from the mountains to the coast. Site preparation is expensive and labor-intensive, but once established, the bushes remain productive for 15 to 20 years or longer.